When Make Architects needed a waterproofing solution for their latest project in the City of London, they turned to IKO PermaTEC hot melt. Here, we set out why and share with you some pictures of this particularly challenging roofscape. 5 Broadgate is truly a “groundscraper”, a term coined by the FT as it announced the unveiling of the UBS new City of London headquarters in May 2006. Just 12 storeys of offices yield over 65,000m2 of high-spec office space, including four football pitch-size trading floors and 7,500m2 of concrete-decked roof and terraces. 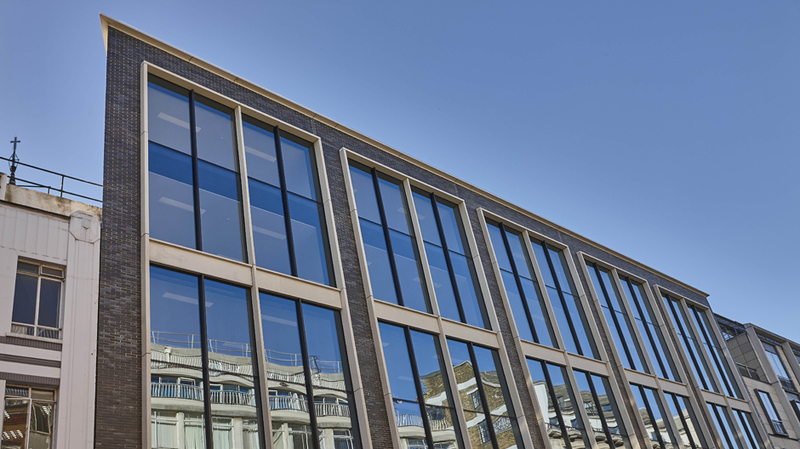 Make partner, Ben Stuart was package architect for the roofing, basements, structure and services on 5 Broadgate. Ben described the roofing strategy when he presented at our #PerfectRoof seminar in October 2014. Waterproofing such an expansive and complex roof has its particular challenges and required, as Stuart said, ‘robust and reliable detailing delivered by contractors who could assure the highest standard of workmanship within the given timescales.’ The choice of waterproofing was to perform for a minimum of 30 years, be cost effective and also contribute towards the building’s design stage BREEAM Excellent rating. Working closely with contractor, Briggs Amasco and construction manager Mace, Make looked at a range waterproofing options and reviewed their buildability. Cold applied liquid – this was also ruled out for the majority of the roofing due to its shorter lifespan (20 years) and higher cost. Also, longer hardening times produced a knock on effect on the overall roofing programme. As a result, cold applied liquids would be reserved for some specific areas only. An inverted roof system with IKO PermaTEC hot melt – this option was chosen because it could be installed much more quickly, was easier to protect, had a longer lifespan and was more cost effective. The speed of the hot melt waterproofing application meant that Make was able to complete sequential quality inspections safe in the knowledge that the waterproofing would then be protected immediately following the installation of the insulation and subsequent pouring of the concrete slab. As well as being cheaper, easily installed and having a longer lifespan, IKO PermaTEC also offered other advantages to the client. The product is manufactured in the UK at a factory in Derbyshire giving it efficient carbon delivery miles. It is produced with zero wrapper waste which reduces on-site waste, making a small contribution towards British Land’s ‘Zero Waste to Landfill’ commitment and towards BREEAM Excellent for the project at design stage. The waterproofing is part of a 600mm roof over-cladding build-up consisting of a 200mm concrete slab, a 7.5mm hot-melt rubberised bitumen membrane, a 200mm thermal extruded insulation and drainage mat, and a 150mm floating slab. The architects were advised that proper installation was vital to the success of hot-melt waterproofing and therefore increased the number of quality inspections as well as agreeing sequential sign-off inspections with Mace. This was particularly challenging for specialist contractor, Briggs Amasco as installation took place in mid-winter, requiring temporary protection to ensure a dry installation surface. The PermaTEC system consists of a high penetration primer, two coats of the 3mm PermaTEC waterproofing membrane with a PermaFLASH-R reinforcement layer in between, and the PermaGUARD-F protection sheet. These layers were all applied before the installation team began work on the next adjacent area. Unlike many cold applied liquids, there is no need with hot melt to wait until each layer hardens. Fifteen minutes after the hot melt was applied to the roof, electronic leak testing was carried out to identify any problems and localised repairs made. This was followed by installation of an extruded polystyrene insulation board – Roofmate SL-A – then an IKO Plasdrain 6 loose-laid drainage mat. The build-up was topped by the overslab of 150mm poured concrete, with pavers and ballast used in areas of light traffic. In his presentation to our #PerfectRoof seminar, Ben Stuart outlined two bespoke details which were developed for the complex roof at 5 Broadgate. The roof has considerable plant, multiple penetrations and an exposed cross-braced structure to waterproof. One challenging aspect at 5 Broadgate was designing waterproofing solutions for around 100 vertical roof penetrations created by perimeter structural steel elements, posts and columns. These vertical penetrations were detailed using a pitch pocket, (a pocket of waterproofing which remains soft in order to maintain a seal during any movement of the penetration). 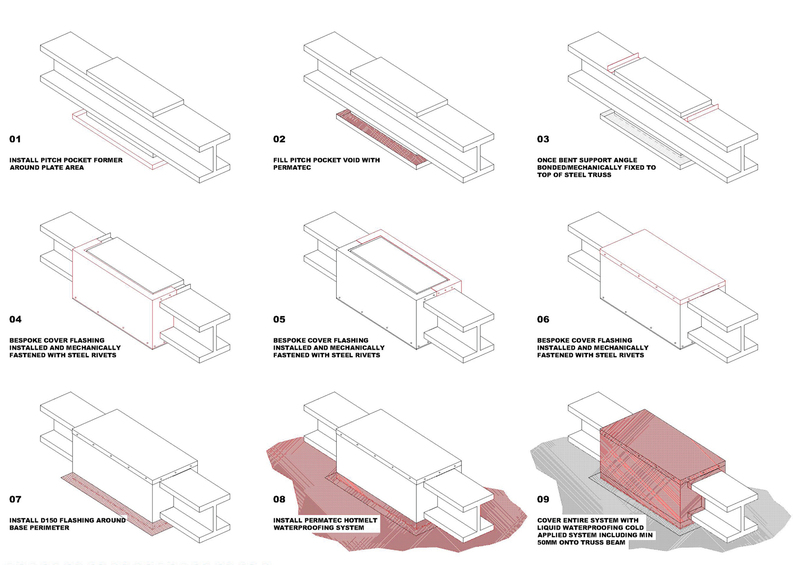 Typically, a concrete upstand of 50mm was constructed around each of the vertical penetrations. This acts as a first line of defence and lifts the waterproofing detail out of any standing water. Then, a minimum of 50mm galvanised formwork was bonded into the hot melt to form the pocket around the penetration. Then the pocket was filled with more PermaTEC hot melt, and protective felt added on top. A key advantage of using a hot melt pitch pocket is that it remains soft, so when the steel expands in the summer, the hot melt will be able to move with the column. For six tricky cross-brace connections, a special solution was required for the junction between columns and cross bracing, to avoid any potential pooling water, despite a pitch pocket detail. 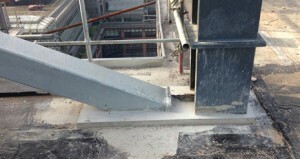 The solution was IKO’s Polimar EC/UV cold-applied liquid waterproofing around the connection plate, over the PermaTEC pitch pocket. The crucial area to be solved was the integrity of the waterproofing to the 15m spliced support truss. During the casting of the structural concrete slab, application of the bolts connecting the splice plates were unexpectedly cast into the structural slab at the perimeter. As a result, the waterproofing detail had to be reconsidered. The solution was a bespoke cover with base flashing over the truss, followed by the PermaTEC hot melt system, then a complete covering of liquid waterproofing. This area was subjected to a 48-hour flood test to ensure complete water tightness. The build-up had created a successful hybrid system of hot melt and cold applied liquid. 5 Broadgate was awarded a BREEAM Excellent rating at design stage, with the roof achieving a U-value of 0.20. This helped contribute to the project’s energy conservation levels being nearly 50% better than regulations require. The project will be completed in the summer of 2016. As the project nears completion, attention shifts from the details of roofing and waterproofing an towards the visible exterior of the building and the interior fitout, however the 7,500m2 roof remains an essential element, its complexity only revealed by aerial photography. ‘The success of the roof waterproofing was a team effort, including contractor, architect and construction manager, in order to manage the complexity and maintain the high standard of workmanship,’ says Stuart.